As the public becomes more aware of puppy mills – large-scale breeding operations with conditions at or below the minimum considered “humane” – more survivors become available for adoption. Usually, the puppies end up in pet stores or are sold over the internet, leaving the parents behind to be bred again and again. Once rescued and adopted out, these dogs can make great, loving family members. However, there are specific issues common for these pups that a potential adopter should be prepared to handle. 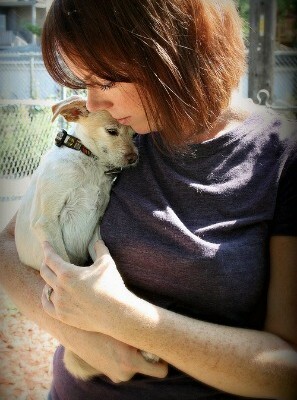 Julia & Mark’s dog, Chauncey, is a puppy mill survivor. Housetraining is probably the most striking issue that can come with puppy mill dogs. Almost all of these dogs will have problems knowing where to go. Having lived their whole lives in a cage, they have no chance to eliminate anywhere else, so they never learned that they have an alternative. They may have trouble interacting with and accepting humans or becoming overly attached. Many puppy mill survivors have had very little interaction with humans, and those interactions are likely unpleasant at best. Even the most well-intentioned, loving, patient humans will be absolutely terrifying to these dogs. Conversely, many of these dogs become overly attached to their new humans, following them everywhere and suffering from separation anxiety when they leave. Leash walking is a completely foreign concept. Being tethered to a human is not a natural behavior for canines in general, so early training is a must for our pet dogs. Here’s a secret: puppy mill dogs don’t get walked. Ever. Even placing a collar on your new dog will probably be a challenge. Crate training can be difficult to impossible for puppy mill dogs. For most dogs, the crate mimics a safe, den-like environment, which can be incredibly comforting. Usually having spent years in a crate, puppy mill survivors can experience the opposite association with the confines of a crate, even with the softest bedding and tastiest treats waiting inside. I’m sorry – this one is gross – but puppy mill dogs often practice coprophagia (eating poop). This can be a natural behavior for any dog, although super gross and tough to deal with, but these dogs tend to suffer from it more than others. They learn to do this out of boredom, hunger, or a desire to clean their living spaces (the small cages where they spend their lives) since sanitation is not a top priority in these situations. The habit may likely carry over into the home environment. Speaking of habits borne out of boredom, obsessive-compulsive behaviors may also follow puppy mill dogs into their new homes. Stereotypic, or repetitive, behaviors such as spinning, chewing, and even barking are all primitive ways of coping with stress and anxiety. I am in no way trying to discourage anyone to adopt a dog that comes from a terrible situation – in fact, these dogs can be awesome pets! When considering adopting any dog, it’s important to be prepared, to stay patient, and to be understanding. In the case of puppy mill dogs, this is even more essential. Remember that no dog misbehaves on purpose; they just haven’t learned what they’re supposed to do in our human world yet. If you’re having trouble with any pet, be sure to contact a certified behaviorist or trainer, and check out this awesome resource! Lynda manages our dog walking team at Rover-Time. Her career focus is on dog training and behavior and her approach is based on science, positive reinforcement, and humane methods to improve relationships between humans and their pets. She’s also a senior trainer at Animal Sense in the evenings and co-parents her own cat and two dogs, Surf and Ryan, with her other half Mary. We have had our rescue puppy mill mama for 8 weeks now and I can honestly say that, short of saying goodbye over the years to our 7 “normal” dogs, this is the hardest thing I’ve ever done. I am just now accepting what it means to let her go at her own pace. Anyone who has a puppy mill dog or who is thinking about making the commitment should read this section at the “awesome resource” cited above: https://bestfriends.org/resources/puppy-mill-rescue-dogs-getting-help-dog-puppy-mill It is a summation of findings from a study done to determine what has worked when rehabilitating these these dogs. It has a link to the full study results which are well worth the bit of time needed to read them. I am hoping to receive some good advice for our puppy mill rescue dog. We understand that we need to be patient and that they are not your typical family pet at first. We chose a puppy mill dog on purpose, because we feel all these dogs deserve a chance at a stable and loving home. We have had our ups and downs these past three weeks, but are pushing forward and looking forward to the day that our little fur baby will be well adjusted and be able to live out her life to the fullest. My question is that she stopped eating a couple days ago after a sound startled her and she bumped her food and water dish and has sense shown a fear of her water and food bowls. What should we do to get her to eat out of said bowls again? We did however, last night got her to eat from off the floor in a different room and she would drink out of the cap of my water bottle. Is there something we can do to help her get over this fear?